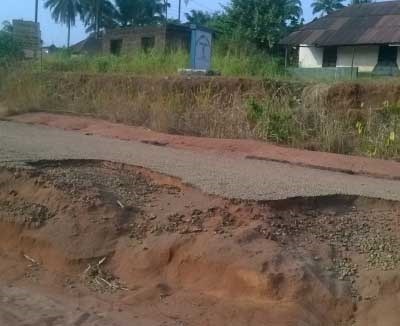 The Federal Government has begun limited repair of the Benin-Ekpoma- Okene Road and will carry out full rehabilitation of the failed portions of the road after the rainy season. Those who use the Benin-Ekpoma-Okene Road can get some respite from daily travel torture, at least for now. The government has begun limited repair of the road and will carry out full rehabilitation after the rainy season. Vice Chairman, Senate Committee on Works, Sen. Clifford Odia, made the disclosure on Tuesday in Benin when he led members of the committee on a visit to Governor Godwin Obaseki of Edo. "We are in the state as part of our oversight function on federal government projects in the state. "We visited the Ewu-Uromi-Agbor Road where about 50% of the work has been done while the remaining 50% will hopefully will be completed soon,” he said. He gave the assurance that complete rehabilitation of the road is captured in the 2017 Budget. The vice chairman noted that the bad state of the road had made it to record high rate of accidents and asked that the pace of work be hastened. The rehabilitation began after the committee held a meeting with the Minister of Power, Works and Housing, Mr Babatunde Fashola.